Terry Marsh has been visiting France since 1974, when (for a few weeks) he exchanged his job in local government for a tent and an unbelievable view of Mont Blanc from Chamonix, and he has returned every year since, often many times...but then he did have a long relationship with a delightful française from Lyon, and plunged whole-heartedly into domestic and social life as a result, even winning at boules at someone's wedding celebrations – which went down like a lead brick! In the 1980s, he began his career as a guidebook writer and photography, and soon turned his attention to the Pyrenees and then the Alps, spending many years following mountain trails and exploring the natural beauty, as he produced ‘100 Walks in the French Pyrenees’ and ‘100 Walks in the French Alps’, all while holding down a ‘proper’ job. 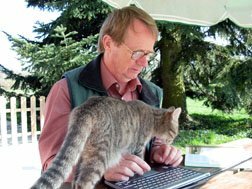 For the last 10 years he has contributed articles to magazines and newspapers, and for a time worked as a tour guide, showing American visitors around the delights of Provence. Terry has revised and added information to a number of Michelin Green Guides, notably the Paris region, the Auvergne and Rhone valley, the Chateaux of the Loire, Languedoc-Roussillon, the French Alps, and the 2012 and 2014 editions of the guide to the whole of France. His iPhone app FRANCE DISCOVERED is mentioned elsewhere, and it was this that gave him the inspiration to create this website. On another level, it was a pleasing gesture in the scale of things, but his writing about Aube-en-Champagne earned him the typically French award of Chevalier de la Commanderie de Saulte-Buchon, which he uses as an excuse to drink champagne at any and every opportunity. He later won an award for writing about chickens! Academically, he is an historical geographer and holds a Master of Arts (Distinction) in Lake District Studies, and a Doctor of Philosophy, both from Lancaster University. He is a Fellow of the Royal Geographical Society and a Fellow of the Society of Antiquaries (Scotland).